EDINBURG — The UTRGV men’s basketball team hit the ground running when the players returned to campus earlier this week after a short holiday break. Starting Tuesday, UTRGV held morning practices that players described as tough, competitive and physical on four consecutive days. They followed each of those sessions with an evening shootaround. Ending the season-long seven-day layoff on Saturday, the Vaqueros’ conditioning was on full display. UTRGV surged late to secure an 80-69 victory against Hampton behind a 30-10 run during the game’s final 10 minutes. University of Texas Rio Grande Valley's Nick Dixon (4) drives to the basket against Hampton in a non conference game at UTRGV Fieldhouse Saturday, Dec 30, 2017, in Edinburg. University of Texas Rio Grande Valley's Nick Dixon (4) drives to the basket against Hampton's Trevond Barnez (22) in a non conference game at UTRGV Fieldhouse Saturday, Dec 30, 2017, in Edinburg. From the 9:49 mark of the second half until UTRGV scored its final point with 32 seconds to play, the Vaqueros connected on 9 of 18 shots from the field, sank 10 of 11 at the free-throw line and had just one turnover. Hampton, meanwhile, was 3-of-13 shooting with six turnovers. The late surge allowed UTRGV to erase a slow offensive start. During the first half, the Vaqueros shot just 25 percent from the field, including 16.7 percent (4 of 24) on 2-points shots, with eight turnovers. During the second half, UTRGV shot 46.2 percent overall and 53.8 percent from 2-point range with just five turnovers. Hill said the team’s success harkens back to the motto he’s worked to establish since he started at UTRGV last season: Attack with discipline. 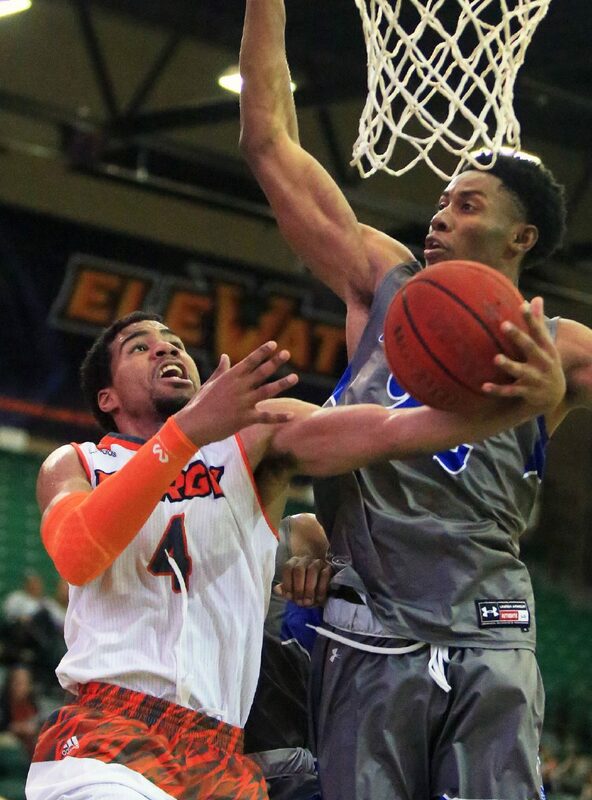 Dixon led UTRGV with 21 points behind a second-half surge of his own. At halftime, Dixon had eight points on 2-of-5 shooting. After the break, he dropped 13, connecting on 5 of 9 attempts. For the game, he also added three rebounds, two steals and three assists without a turnover. UTRGV’s leading scorer with 20.6 points per game, Dixon has cracked double digits in scoring in every game this season. 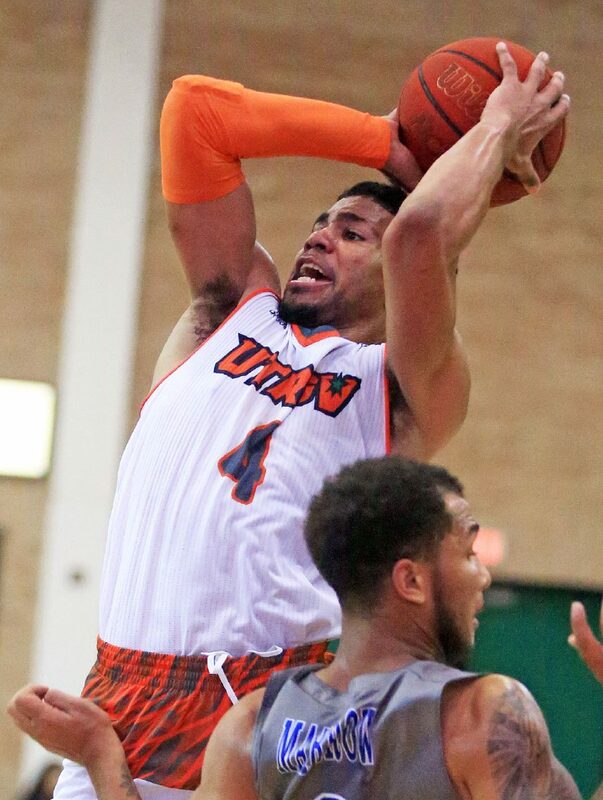 Terry Winn was UTRGV’s next leading scorer with 12 points. He also notched five rebounds despite playing just 14 minutes in his first home action with UTRGV. Winn sat out the fall semester after transferring from UTEP and was limited in practice for much of that time as he recovers from a knee injury. Winn was aggressive looking for his shot on Saturday, connecting on 3 of 11 shots from the field, including 2 of 3 from beyond the arc.